﻿ The heated debate between active versus passive management seems to have gotten hotter this year as investors search for ways to cope with the new normal of low interest rates and sluggish economic growth. Proponents of passive, or “index-style,” investing generally believe markets are efficient and note the benefits of using low-cost products to gain exposure to financial markets. On the flip side, active managers advertise the value of well-researched strategies designed to generate “alpha,” or excess returns, relative to a benchmark. As the recent election reminds us, debates are judged on who won or lost rather than the degree to which the opponents reached some common ground. I believe viewing the active-passive argument through the lens of “right” and “wrong” oversimplifies the discussion and detracts from the more important goal of developing asset allocation strategies that strike a balance between investors’ return objectives and the degree of risk they are willing to take. 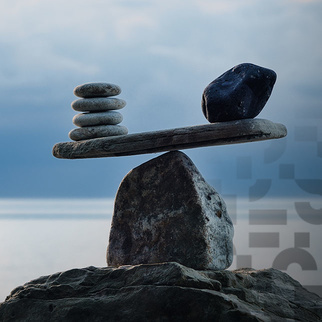 In reality, combining active and passive investments within a well-balanced portfolio is, in my view, the most practical and effective way to create a better outcome for investors. It may seem surprising that I’m advocating for passive strategies because I’ve spent my career focusing on active investing. However, I believe that by understanding the benefits and limitations of different investment approaches, individuals can choose the most appropriate asset mix to meet their financial goals. With this in mind, passive tools, such as indexed mutual funds or exchange traded funds (ETFs), provide a low-cost way to access widely traded asset classes that provide exposure to broad market trends. The S&P 500, commodities and international equities all fit well within these vehicles. That said, passive funds have shortcomings that make them inefficient structures to access the less liquid and more specialized areas of the market. Within these less liquid and often private markets, the approach of active managers is often most effective. Extended settlement: Loans aren’t considered securities, like stocks or bonds, and trade in a secondary market of dealers and financial institutions, such as hedge funds and insurance companies. These parties are responsible for determining settlement terms specific to each transaction, meaning several weeks or months could pass before money exchanges hands and a trade is complete. By comparison, exchange requirements mandate stocks and bonds to settle three days after their transaction date (T+3).1 The Loan Syndications and Trading Association (LSTA) estimates 62% of loan transactions take more than seven days to close, while the median settlement period is just under two weeks.2 Asset valuations can change drastically overnight, let alone throughout the course of a month. The risk for indexed bank loan funds that trade in real time but own assets with longer settlement periods becomes a liquidity mismatch. If investors want out on day one, but selling a loan takes two weeks or longer, the fund needs to find cash to bridge the difference, otherwise it runs the risk of a liquidity shortfall. This leaves investors vulnerable to sudden price swings and, in my view, is a key reason why bank loans and ETFs are not a good match. Trading liquidity: Adequate trading liquidity exists when investors can buy and sell assets without triggering large price movements. For example, Apple’s and Microsoft’s heavy trading volumes allow investors to execute trades without heavily influencing stock prices. On the other hand, the loan market enjoys less trading liquidity because transactions occur “over the counter,” without the benefit of leveraging a deeper exchange platform. Further, the shrinking number of market makers resulting from post-crisis regulations, combined with a larger amount of fixed income securities, has exacerbated the situation. For instance, since 2006 dealer inventory has dropped by 75% while the aggregate corporate debt load has increased by 3x.3 These factors make it challenging to quickly offload larger bank loan positions without affecting their prices. In the event investor panic prompts fund outflows, the risk of selling assets at “fire sale” prices to fill redemption requests becomes a reality. In my view, this is yet another reason why passive funds aren’t the best option for investors interested in accessing the bank loan market. As evidence of the challenges to overcoming these structural and liquidity considerations, only five bank loan ETFs exist and account for less than half a percent of the $2.4 trillion ETF universe.4 BlackRock, the world’s biggest money manager, and Vanguard, the company that pioneered the concept of indexing, are noticeably absent from this corner of the market and have each voiced reservations over risk management.1,5 Admittedly, there are several ways passive funds can manage liquidity to absorb redemptions, such as holding cash, establishing a line of credit, or owning more liquid senior loans, just to name a few. Yet each of these attempts to mitigate the liquidity mismatch inherent in these funds actually serves to hamper performance and dilute an index fund’s correlation to the underlying asset class it’s designed to track, offering a potential muddied experience to investor portfolios. Active managers generally have the resources and expertise to fill this void, offering a natural complement to passive allocations in investment portfolios. Successful active managers rely on sound research to develop strategies designed to outperform the benchmark. Their approach is often most effective when targeting areas of the market that are difficult for the investing public to enter and trade regularly. As a result, blending passive and active strategies may be the best and most efficient way to access a range of diversified investments to meet one’s long-term financial goals. 1 “Risks and Opportunities in Senior Loan ETFs,” Morningstar ETFInvestor, March 2016, http://ibd.morningstar.com/article/article.asp?id=755025&CN=brf295,http://ibd.morningstar.com/archive/archive.asp?inputs=days=14;frmtId=12,%20brf295. 5 “Beware Bank-Loan ETFs,” Barron’s, August 2014, http://www.barrons.com/articles/SB50001424053111904780504580051751192202916.